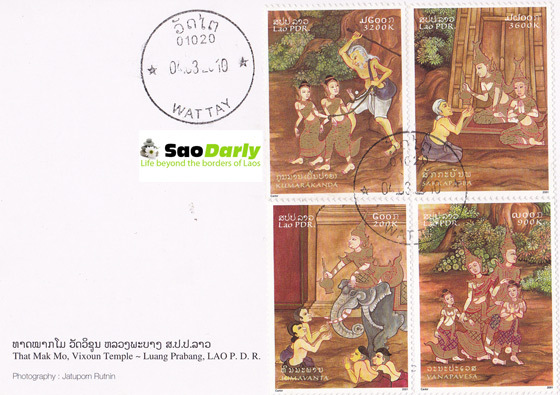 Postcard from Laos depicting Wat Xieng Thong temple in Luang Prabang, franked with Tak Bat or Almsgiving Lao stamps on March 04, 2010 at Wattay International Airport Post Office. The stamps were issued in 2007. 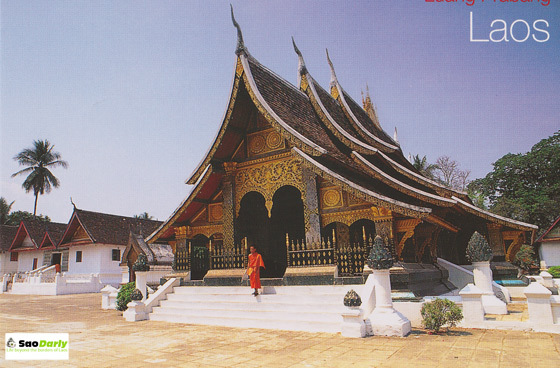 Postcard from Laos with That Mak Mo or Vixoun Temple in Luang Prabang on the front and with Vessantara Lao stamps, postmarked at Wattay International Airport, in Vientiane on March 04, 2010. Miss Lao Year New Parade for New Year Festival in Luang Prabang postcard with a set of Lao Wedding Costume stamps on the back, postmarked on March 04, 2010 at Wattay International Airport post office in Vientiane, Laos. 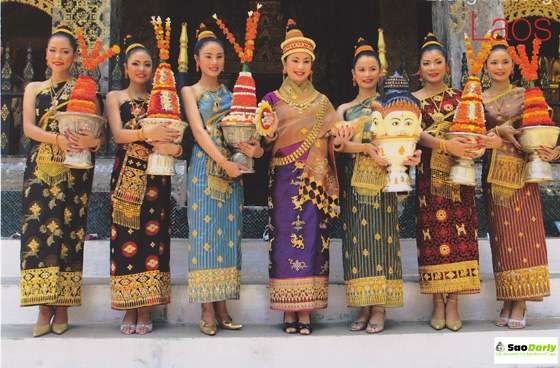 Postcard from Laos with Nang Sang Karn or Miss Lao New Year at the Pi Mai Festival in Luang Prabang. On the back, there is a set of Lao Lamvong Dance stamps, postmarked on March 04, 2010 at Wattay International Airport in Vientiane, Laos. A postcard from Laos picturing young school girls with 50th Anniversary of Lao-United Nations Cooperation stamp and Tad Sae Waterfall – Luang Prabang Province stamp on the back. The stamps were postmarked in Xieng Khouang on November 12, 2010.